When was the last time you were this discouraged by Minnesota pro sports? Usually, when things are going badly in Minnesota sports, there's something that passes for a silver lining. The Lynx have filled that role frequently since they started winning championships in 2011, and other teams have stepped up their games at times to give us a break. Right now, though, what is there to feel good about? That feeling may be all the more acute because of the thrills and surprises that were part of 2017-18. Let's cycle through the current carnage. Vikings: The 29-29 Packers tie led to the purging of rookie kicker Daniel Carlson and that was followed by the blowout loss to Buffalo, which entered the game winless and as a 16 1/2-point underdog. Add to that the mental health situation involving star defensive end Everson Griffen. And the schedule has two rough road games coming up next at Los Angeles and Philadelphia. How many of you had the Vikings at 1-3-1 after five games? Twins: Young team cornerstones Miguel Sano and Byron Buxton have been dreadful and/or absent this season and the underperforming roster was purged at baseball's trading deadline. The best thing you can say about the Twins right now is that they have only to win one of their final six games to avoid losing 90 games. The worst thing -- aside from that awful "This Is How We Baseball" slogan -- is that little about 2018 inspires optimism for 2019. Wolves: Jimmy Butler's deal has sapped the excitement that should have been generated by the team making the playoffs for the first time in 14 years. 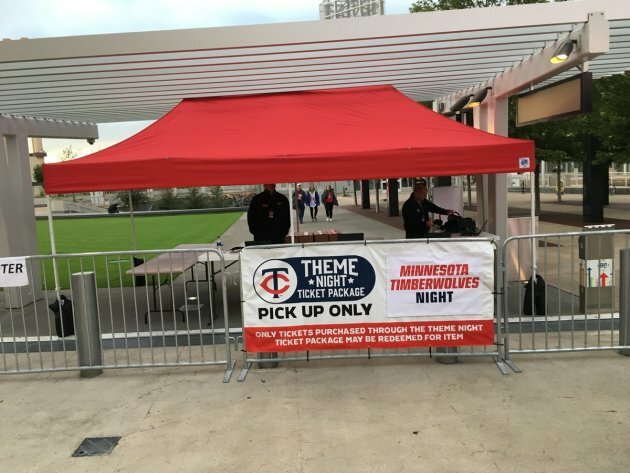 Instead of words, we'll capture the mood with this photo, which was taken about a half-hour before first pitch of Tuesday night's Twins-Tigers game. Where is everyone? Wild: Fans (and some players) expected a shake-up over the summer from Paul Fenton, the team's new general manager. But this season's roster is pretty much the same as the one that ended last season on a sour note when the Wild were eliminated in five games by Winnipeg. In the Wild's defense, good health and a good start to the season could create some buzz. But how much preseason chatter have you heard about the team? Anyone? United: The team's two-season record is 20-34-9 and many supporters weren't overly thrilled when Loons CEO Chris Wright gave coach Adrian Heath and general manager Manny Lagos his support recently by bestowing "a passing grade" on each of them. Yes, a transcript filled with C's gets you a diploma, but it's hardly anything to feel good about.. Here's the reaction of Loons supporter Mark Fangmeier to the Star Tribune's recent story in which Wright discussed the team. Lynx: After winning four WNBA titles in seven years, the tires started to show wear this season with the team finishing seventh out of 12 teams, a record barely above .500 and being eliminated in the first round of the playoffs. The best thing that a Lynx fan can take away is that other teams improved significantly while the Lynx and Sparks -- WNBA finalists in the previous two seasons -- regressed. That bodes well for the league as a whole while providing a challenge for Lynx coach/GM Cheryl Reeve in overhauling a veteran roster. One bonus thought about the Lynx. Yes, 2018 was a clunker. But if Reeve had opted to take apart the team's aging core after winning the 2017 title, do you think it would have been a popular move? So much gloom in so short a time. The good news is that things have to get better, right? Buffalo beating: Sign of bad things ahead or a bump in the road for Vikings?